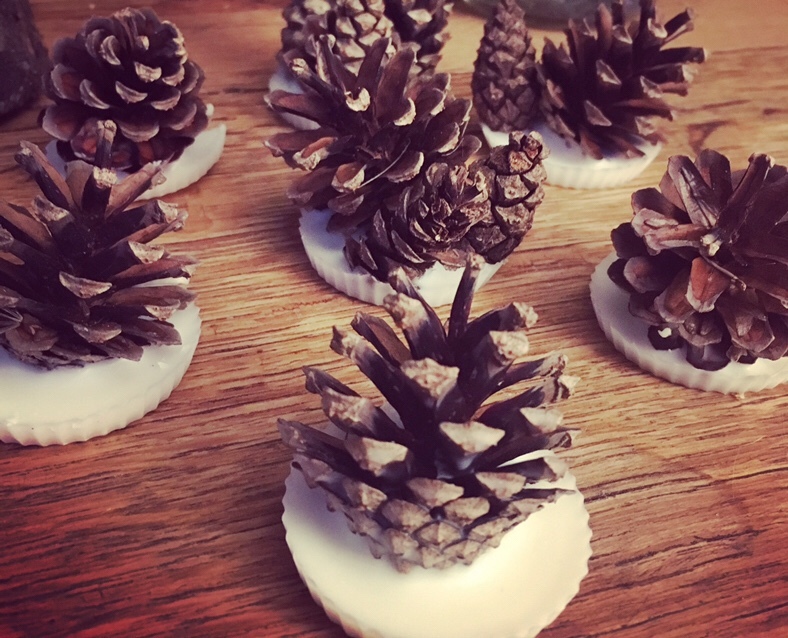 The best thing about making these is foraging for the pine cones. We spent a sunny morning walking through our local woods, and we were lucky to find the most magical collection of toadstools and mushrooms on the way. We came home pockets full of beautiful pine cones, and for once we had something useful to do with them. Optional candle scent; cinnamon, or sandalwood I think would be lovely. Firstly, gather all your pine cones. Size doesn’t matter here, but give them a quick brush to remove dust and bits of forest-floor debris. Pine cones which are tightly closed will open once exposed to the warm, so you may want to store them inside for a week before using. When you’re ready to ‘cook’, line a cupcake tin with cases and place one of your tea lights or candles into each. Make sure you remove the little metal cases if using tea lights, and tweak the wicks so that they are standing upright and proud of the wax; it’s much easier than fishing for them later. Place in a moderate oven and keep checking until the wax melts and resembles water. At this point you can add a drop of candle scent to each, or simply leave plain. Once the wax has melted, move the wicks gently to one side of the case, using tweezers This will ensure that the wicks don’t get lost underneath the cones. Then simply place a pine cone into each case; the wax will rise around it and hold it firmly in place as it sets. When the wax has cooled and set, lift the cases out of the pans and peel away the cupcake case, these are now ready to use. Just light the little ‘wick’ and set under your kindling.